So far we have given a fairly complete overview of an emerging approach to knowledge. What remains is to test it by applying it to a real-life theme. What theme do you find most interesting? Education? Or democracy? Or what to do about the large contemporary issues? We can focus on any theme you choose. And yet our conversation is bound to be different from any you've had. The difference is made by the overarching principle that defines our initiative – where education, democracy, religion, health and everything else are seen as inter-related pieces in a larger system or hierarchy of systems. Where those systems are perceived as gigantic mechanism, which determine how we live and work, and what the effects of our lives and work are going to be. Where the reconfiguration of those systems, to suit humanity's new condition, is seen as humanity's next evolutionary step. And where the new information technology is conceived of as our society's new 'nervous system', which enables and also demands that our systems, and people, should communicate and collaborate in an entirely new way. There is, however, a single theme, which – in this systemic approach to knowledge, and to institutions and issues – must be given priority. The problem now is not to get information to people, but how to get some meaning of what's happening.(...) Even the great story of inductive science has lost a good deal of its meaning, because it does not address several questions that all great narratives must address: Where we come from; what's going to happen to us; where we are going, that is; and what we're supposed to do when we are here. Science couldn't answer that; and technology doesn't. It is absolutely necessary to find a way to change course. What is the nature of our condition? Where are we coming from? Where are we headed? Do we really need to change course? We've chosen to put to test knowledge federation, and to set the stage for our dialogs, by shedding some light on these questions. Donella Meadows talked about systemic leverage points as those places within a complex system "where a small shift in one thing can produce big changes in everything". She identified "the mindset or paradigm out of which the goals, rules, feedback structure arise" as the most impactful kind of systemic leverage point. 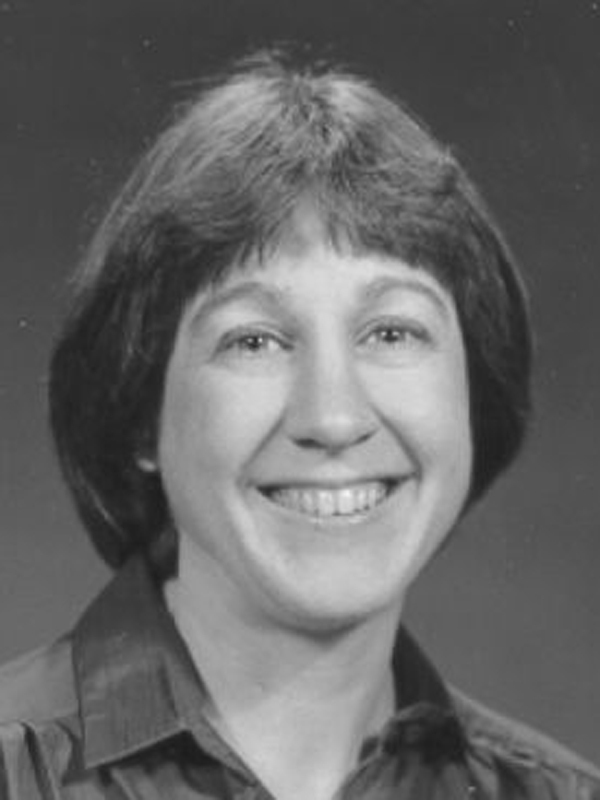 She identified specifically working with the "power to transcend paradigms" – i.e. with the assumptions and ways of being out of which paradigms emerge – as the most impactful way to intervene into systems. We are about to propose – as an overarching theme for our various conversations – to approach our contemporary condition in this most powerful way. Notice this subtlety: A novelty in this approach to knowledge is that it cannot and doesn't want to tell how the things "really are in reality". Its purpose is to allow for free creation of a multiplicity of ways of looking at any single theme – and to let the resulting insights act upon each other. Communication in this new approach to knowledge is not and cannot be one-way. By designing and evolving these conversations, we will be developing a new form of social life, where people and ideas interact and improve one another. Don't be deceived by this word, "conversations". These conversations are where the real action begins. By organizing these dialogs, we want to develop a way to bring the themes that matter into the focus of the public eye. We want to bring the insights of giants to bear upon our understanding and handling of those themes. And we want to engage us all to collaborate on combining those insights with everyone else's, and evolving them further. The purpose of these conversations is to create a public discourse that works; which makes us collectively creative, knowledgeable and intelligent. We want to evolve in practice, with the help of new media and real-life, artistic situation design, a public sphere in which the themes, the events and the sensations are stepping stones in our advancement toward a new cultural and social order. The medium we'll develop will truly be our message! There is a way of listening and speaking that fits our purpose quite snugly. 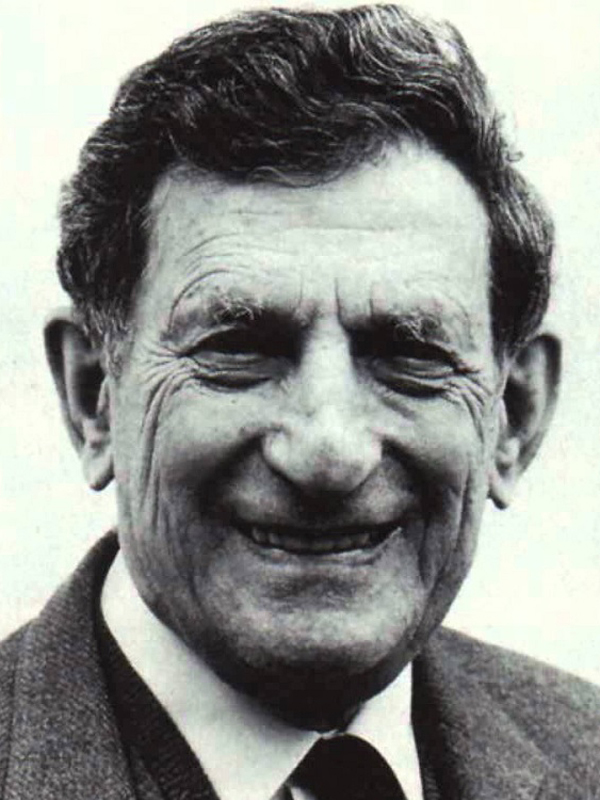 Physicist David Bohm called it the dialogue. We build further on his ideas and on ideas of others, we weave them together into another keyword we use, the dialog. Bohm considered the dialogue to be necessary for resolving our contemporary challenges. Here is how he described it. I give a meaning to the word 'dialogue' that is somewhat different from what is commonly used. The derivations of words often help to suggest a deeper meaning. 'Dialogue' comes from the Greek word dialogos. Logos means 'the word' or in our case we would think of the 'meaning of the word'. And dia means 'through' - it doesn't mean two. A dialogue can be among any number of people, not just two. Even one person can have a sense of dialogue within himself, if the spirit of the dialogue is present. The picture of image that this derivation suggests is of a stream of meaning flowing among and through us and between us. This will make possible a flow of meaning in the whole group, out of which will emerge some new understanding. It's something new, which may not have been in the starting point at all. It's something creative. And this shared meaning is the 'glue' or 'cement' that holds people and societies together. Contrast this with the word 'discussion', which has the same root as 'percussion' an 'concussion'. It really means to break things up. It emphasises the idea of analysis, where there may be many points of view. Discussion is almost like a Ping-Pong game, where people are batting the ideas back and forth and the object of the game is to win or to get points for yourself. Possibly you will take up somebody else's ideas to back up your own - you may agree with some and disagree with others- but the basic point is to win the game. That's very frequently the case in a discussion. In a dialogue, however, nobody is trying to win. Everybody wins if anybody wins. There is a different sort of spirit to it. In a dialogue, there is no attempt to gain points, or to make your particular view prevail. Rather, whenever any mistake is discovered on the part of anybody, everybody gains. It's a situation called win-win, in which we are not playing a game against each other but with each other. In a dialogue, everybody wins. Two people could be talking over a coffee table. If they turn on a smartphone and record, their conversation can already become part of the global one. What we, however, primarily have in mind are public dialogs, which begin in physical space and continue online. We have a hunch that such dialogs could become true sensations! Already our resistance to this emergence, our blind spots, our reluctance to make a step – are downright sensational! We have developed the Paradigm Strategy poster as an evolving roadmap to the key point. As we suggested above, the key point is an overarching and collectively created and shared insight or gestalt, which clarifies the nature of a situation, and shows how to handle it. The key point of this poster, and of our conversations, is envisioned as a wormhole into a new social and cultural reality. The poster turns our conversations into a practical way to change course. 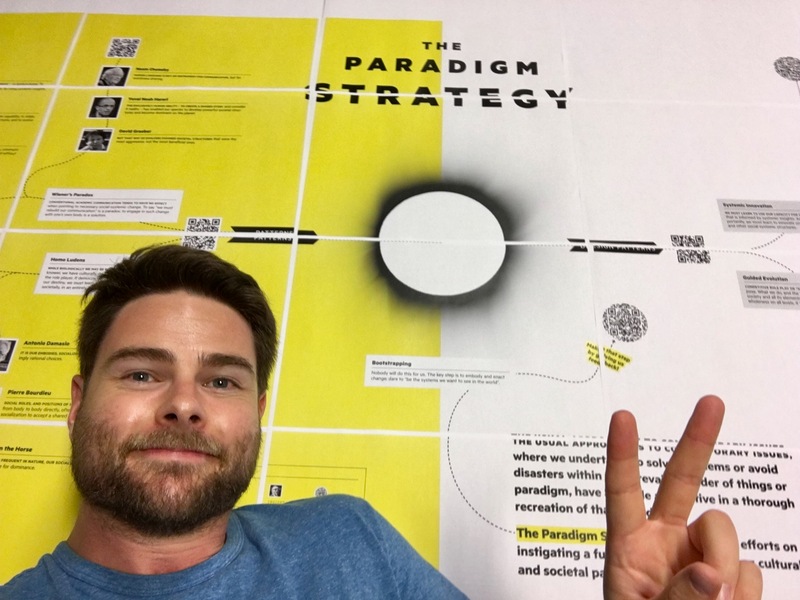 Fredrik Eive Refsli, the leader of our communication design team, jubilates the completion of The Paradigm Strategy poster. We recommend that you look at the poster as we speak. You may imagine the left-hand side of the poster, which has the yellow background, as a roadmap for a collective ascent to a mountain top, from which the key point – which is in the middle of the poster – can be clearly seen. Four ways to reach the top are offered. You will recognize that they are threads – each joining three vignettes together. The right-hand side of the poster, which has white background, shows how to follow the direction the key point is pointing to. The poster as it is now is a starting point for our dialogs. The dialogs will be federated, with the help of suitable technology such as the Debategraph. The map will be updated as necessary, and the overall result will be used as a starting point for the next dialog, which will develop it further. The key point offered is in essence what we've presented on the front page, with the help of the bus with candle headlights or the Modernity ideogram. The idea is to challenge the paradigm, the way of functioning and evolving culturally and socially, where unwavering faith in "free competition" and "the invisible hand" has precluded the use of knowledge. Can we once again empower knowledge to guide us? Can knowledge once again make a difference? The poster is conceived as an invitation to begin to bootstrap – and in that way join the emerging paradigm as an aware and active participant. The poster is interactive; the QR codes will open up files with further information (they are hyperlinks, so that also the digital version of the poster is interactive). The "bootstrapping" thread leads to the QR code and file with an interactive online version of the poster – where it will be possible to post comments, and in that way be part of the online dialog, through which the presented ideas, and the poster itself, will be developed further. Let's begin with the first thread, in the upper left corner. Its focus is on the steering system of "spaceship Earth" (as Fuller called our metaphorical bus) – an issue of some interest, if we should consider "changing course". The first giant in this thread is Norbert Wiener. Wiener studied mathematics, zoology and philosophy, and got his doctorate from Harvard in mathematical logic when he was only 17! He went on to do seminal work in several fields, including cybernetics – the science of steering. The following excerpt is from Wiener's 1948 book Cybernetics, "control and communication in the animal and the machine". There is a belief, current in many countries, which has been elevated to the rank of an official article of faith in the United States, that free competition is itself a homeostatic process: that in a free market the individual selfishness of the bargainers, each aiming to sell as high and buy as low as possible, will result in the end in (...) the greatest common good. This is associated with the very comforting view that the individual entrepreneur, in seeking to forward his own interest, is in some manner a public benefactor, and has thus earned the great rewards with which society has showered him. Unfortunately, the evidence, such as it is, is against this simple-minded theory. Translate "homeostatic process" as "steering", and you got the point. Or one half of Wiener's point, to be exact. Wiener makes his point by summarizing their insights, and explaining how they are confirmed by everyday experience. We've talked about how Erich Jantsch continued this thread in Federation through Stories. We'll here only highlight two points, which are two stages in the development of Jantsch's own ideas: (1) "The task is nothing less than to build a new society and new institutions for it. With technology having become the most powerful change agent in our society, decisive battles will be won or lost by the measure of how seriously we take the challenge of restructuring the “joint systems” of society and technology." (2) The most powerful interventions into a system are the ones that affect how the system evolves. The key is to understand how the way we ourselves are present in the system (our values, principles and actions) influences the system's evolution. Let us fast-forward to Ronald Reagan and to this thread's conclusion. In 1980, the year when Erich Jantsch passed away, Reagan won the U.S. presidential elections by running on the invisible hand agenda. Reagan claimed. Which of course meant that "the individual selfishness" combined with the free competition is not only the only steering that spaceship Earth needs – but also the only one we can trust. How did Reagan reach this conclusion? In what way did he win this battle of opinions? Notice that Reagan had no technical expertise to argue with giants. His expertise was as a media artist; he was trained literally as a role player. But Reagan didn't really need to argue with giants. He could just simply – ignore them! Reagan, and the American public, ignored not only the giants, but also thousands of articles of other researchers in cybernetics and in game theory, who followed in the footsteps of giants. We are back to Galilei in house arrest. Four centuries later, there is no need for Inquisition trials; or for house arrest. There is no need even for censorship! In the society where powerful media are used to only broadcast messages, it's the campaign dollars and the air time they buy that decide what the people will believe. And what direction the "spaceship Earth" will take! to get an idea how also the effects of The Club of Rome's "The Limits to Growth" study could have been annihilated. And how our political discourse became as it is. Already this single thread is sufficient to see the Wiener's paradox. We use this pattern to point to situations where academic research has no effect on public opinion and policy. And to the systemic causes of this phnenomenon. To see what the Wiener's paradox means in practice, imagine us academic researchers speaking to the political leaders and the public through a telephone line. But the line has been cut! And there is anyhow nobody on the other end listening. Like good Christians, we turn the other cheek. We just publish more. And as we do, the insights of giants become dimmer. We ourselves may no longer remember them. Wiener did not formulate the paradox. He just created it (he created an instance of it) – by first pointing out that the communication line was broken; and then committing to it his own insights. The academic community to whose inception he contributed followed him. How pervasive is this paradox? When we do research to understand some real-world problem – are we in a real sense contributing to its solution? Or are we only re-instantiating the paradox? What are the scientists to do next? There is a growing mountain of research. But there is increased evidence that we are being bogged down today as specialization extends. The investigator is staggered by the findings and conclusions of thousands of other workers — conclusions which he cannot find time to grasp, much less to remember, as they appear. Yet specialization becomes increasingly necessary for progress, and the effort to bridge between disciplines is correspondingly superficial. Professionally our methods of transmitting and reviewing the results of research are generations old and by now are totally inadequate for their purpose. 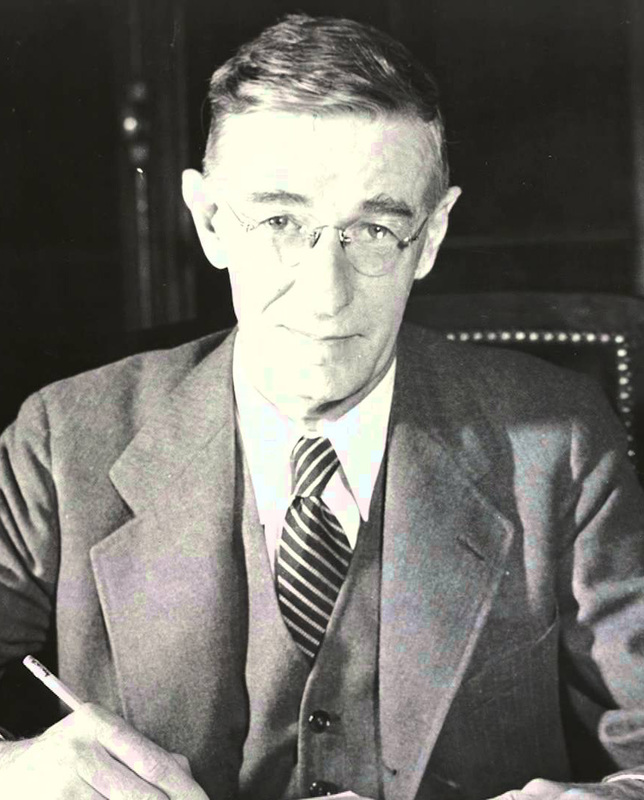 Vannevar Bush was an early computing machinery pioneer, who before the World War II became the MIT professor and dean, and who during the war served as the leader of the entire US scientific effort – supervising about 6000 chosen scientists, and making sure that we are a step ahead in technology and weaponry, and the bomb. Norbert Wiener heard him. He cited Bush in 1948 Cybernetics, as part of his argument that our communication is broken. And of his warning that we were about to lose control. Wiener was making a case for cybernetics as the discipline that would inform the repair work. Doug Engelbart also heard him. He read Bush's article in 1947, in a Red Cross library erected on four pillars, while stationed as an army recruit in the Philippines. He too carried Bush's project further, by providing the required technology. Doug foresaw (already in 1951!) that the enabling technology would not be the microfilm as Bush thought (microfilm too needs to be sent and broadcasted), but digital computers equipped with interactive interfaces and linked into a network. He physically created this "super new nervous system" for us, and showed it in his 1968 demo (see Federation through Stories). What should be the next step in this process? You'll notice that the first design pattern on the right-hand side of the poster is systemic innovation. If we should give the systemic insights the impact they need to have, and if we should use the information technology as it was meant to be used – we must now learn how to weave them together and apply them in real-life system design; or evolution. But what if Reagan was right? Perhaps "the invisible hand" is our best guide? What can Darwin's theory tell us about social evolution? How well has the "survival of the fittest" served us so far? What do we really know about this theme? These questions are addressed by the second thread on the poster. From the studies of evolution we'll adopt an insight that Richard Dawkins explained in "The Selfish Gene" – which led to the development of "memetics" as a research field applying the theory of evolution to society and culture. The idea is to understand evolution as favoring the fittest gene – or meme or 'cultural gene', when the social and not the natural world is our interest. Whether we may want it or not, evolution by the survival of the fittest will blindly make the fittest memes proliferate. This may seem like an evolutionary error. But Yuval Noah Harari is there to explain why it's not – why this singularly human ability, to create a story and make it a shared reality, made us the dominant species on earth. Put a gorilla and a human being on a deserted island, Harari explains, and guess who's more likely to survive? But if you put ten thousand gorillas on a football stadium, you'll get complete chaos! It is our shared story that organizes or gamifies our behavior! Harari pointed to money as a prime example of such a story. Give a gorilla a banana – he'll gladly take it. Ask him to trade it for a dollar – he'll most surely refuse. The reason why a printed piece of paper has more value to us humans is that we jointly believe it does. How has the money, as our shared story par excellence, been directing our societal and cultural evolution? What sort of social organization, what kind of behavior did it favor? In the third vignette of this thread, David Graeber, the anthropologist, will point to an answer. The story is adapted from Graeber's book "Debt; the first 5000 years". We here use it as a parable. Imagine that you are living 23 centuries ago, that you are an exceptionally gifted young king, and that you've received the best education available in your time. Your ambition is no less than to rule the world. You know that with an army of 100 000 men you have a good chance to succeed. But there's a logistical challenge: To feed and clothe an army of that size, you'll need an army of 100 000 supply workers. So you think of a solution: You'll print coins and give them to your soldiers as salary; and you'll request of everyone else to pay you those coins as taxes. In no time everyone will get busy taking care of your soldiers, and supply workers won't even be needed! Your business model, as we might call it today, is now almost complete; but you've still got one problem to solve. Alexander the Great – the historical king we've asked you to impersonate – needed half a tone of silver a day to maintain an army that could satisfy his ambition! How could anyone secure such massive amounts of precious metals? Alexander had, it turned out, two options at his disposal. And he used them both. One of them was to raid foreign countries, turn free people into slaves, and have them mine silver and gold. The other one was to raid foreign monasteries and palaces, and turn sacred and artistic objects of silver and gold into coins. Your business model is now complete. You might object that it's a kind of a Ponzi scheme; but as you know from history, for awhile it was quite "successful". Our theme here, however, is the cultural and human consequences of this way of evolving. Who is, really, the winner in this evolutionary game? We let you draw your own conclusions. As the University of British Columbia law professor, Joel Bakan had an insight that, he felt, just had to be federated. It took him seven years. The result was not only a popular book, but also an award-winning documentary. Both are called The Corporation. You may watch the film by clicking here. Bakan showed how through a legal-political evolutionary process, the corporation acquired the legal status of a person; and became the most powerful institution on the planet. Most of us are working for corporations, directly or indirectly. The corporations organize us into super-organisms, which turn our daily work into real-world impact. Who are we really working for? What sort of character does this 'person' have? Bakan goes through a checklist and shows that the corporation exhibits all the characteristics that define the psychopath. Modernity did not make people more cruel; it only invented a way in which cruel things could be done by non-cruel people. Under the sign of modernity, evil does not need any more evil people. Rational people, men and women well riveted into the impersonal, adiaphorized network of modern organization, will do perfectly. Do you see where our chosen evolutionary stream is carrying us? Do you think we'll become "sustainable" by letting it carry us ever further? This way of evolving was arguably the only one possible, while our tribes were competing for survival with harsh nature and one other. Now that our global tribe is about to destroy its life-support system, this way of evolving has become simply impossible! [E]ven if people fully develop their potential, they cannot give direction to their lives, they cannot forge their destiny, they cannot take charge of their future—unless they also develop the competence to take part directly and authentically in the design of the systems in which they live and work, and reclaim their right to do so. This is what true empowerment is about. The first prototype on the right-hand side is the Knowledge Federation transdiscipline. When after our first year of self-organization toward the transdiscipline we came to the Silicon Valley to break the news (at the workshop we organized within the Triple Helix IX international conference at Stanford University, in July 2011), we began by telling a springboard story called Knowledge work has a flat tire. Our point was that knowledge work has a structural defect; and that this structural defect must be taken care of before we can reasonably continue to speed ahead (by producing, and broadcasting more). We then introduced Knowledge Federation as (a prototype of) a new kind of institution, roughly similar to a tailor workshop, where alterations to professions or institutions or systems can be made to better suit the people who work in them, and our society.